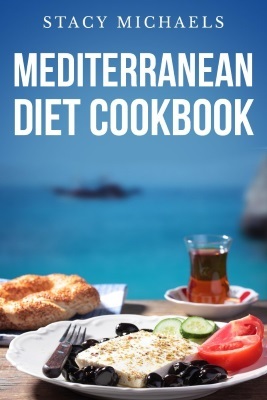 The Mediterranean Diet (MD) is based on the traditional foods eaten in the countries surrounding the Mediterranean Sea. What’s so special about this one? Well, for starters, people living in this region tend to be incredibly healthy, and those who follow the traditional meals and lifestyle are usually having a healthy weight regardless of how much exercise they get. In this guide, we’ll discuss how this “lifestyle” works and also provide you with some great resources for meal plans, apps, recipes, and cookbooks. 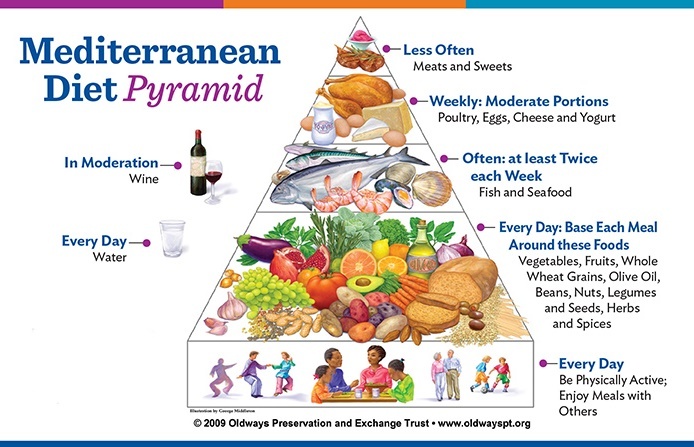 To understand what types of foods you should be eating, you first need to know the Mediterranean Diet Pyramid. The pyramid is broken down into daily, weekly and monthly foods. 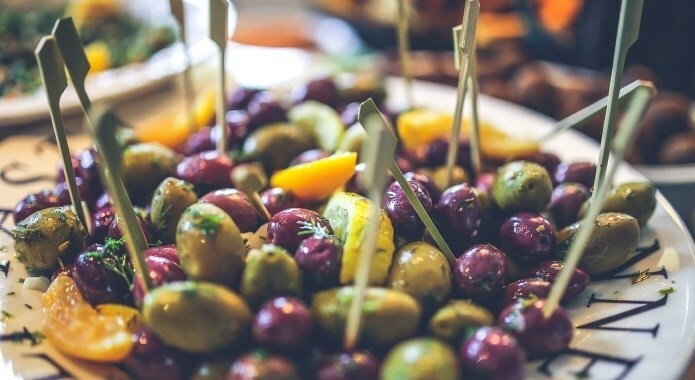 People living in the Mediterranean area tend to eat a generous amount of fresh vegetables, whole grains, vegetarian proteins, olive oil, and nuts. They eat red meat and wine in moderation along with sweets and cheese. Let’s take a closer look at individual categories of this pyramid. 4-8 servings of non-starchy vegetables. These are almost all you can think of except potatoes, winter squash, peas, and corn. 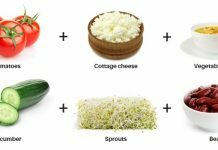 4-6 servings of starchy vegetables and whole grains. 1-3 servings of nuts and legumes. 4-6 servings of healthy fat, such as olive oil. 1-3 servings of poultry, if desired. 1-3 servings of dairy. Typically, low-fat dairy is preferred. This includes light yogurt or low-fat cheeses. Red meats, such as beef, veal, and lamb, are only eaten three to four times per month. Sweets are also limited this way. Pay attention: Each day, you need to drink a lot of water and no more than two drinks of alcohol for men and one drink for women. It’s easy to see why this diet is so good for your organism. 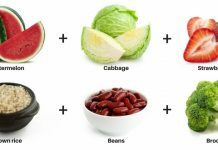 It is rich in vegetables, beans, whole grains, and healthy fats. Red meats, cheese, and sweets are eaten in moderation, which helps you maintain a proper weight while also improving the condition of your heart. There are many easy meal options here, and many of the plans allow for leftovers to be eaten later in the week. 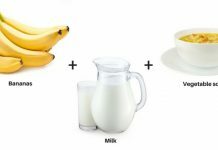 Pay attention: This is a great option for those who are on the go or don’t really have time to cook three times per day, every day. 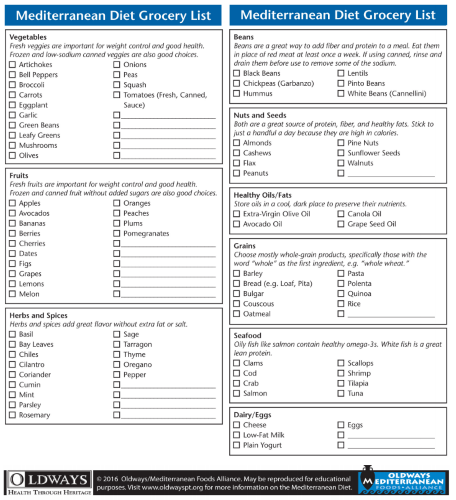 This is an entire diet system complete with meal schedules and food lists. On this menu, you’ll find stuff like lentil soup, lamb chops, honey yogurt, greek salad, and salmon. 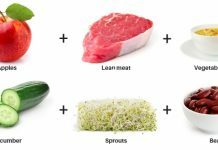 All these meals are easy to prepare and taste great too. Everything is laid out for you with this system, so if weight loss is your goal, this is a fantastic option. Pay attention: All this is packed in amazing free 56 pages long pdf file that is available for download at IntermountainHeartCenter.com. 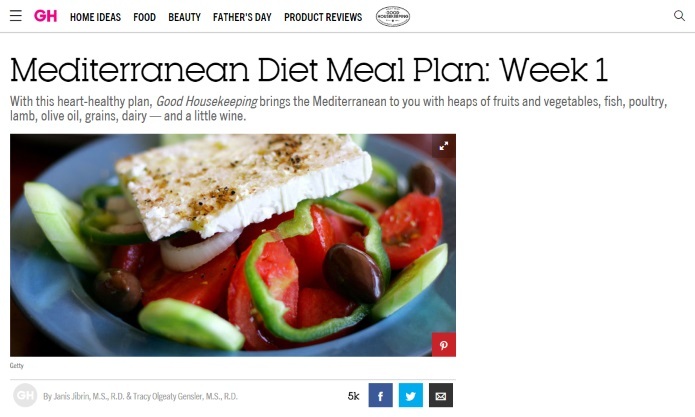 Dr. Oz offers a convenient shopping list that includes all of the staples in the Mediterranean Diet. All items are conveniently grouped together in categories according to where they are in the store. 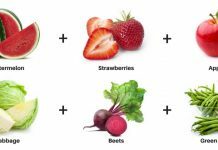 This makes it very easy to get and buy all the required food for your meals, so you have all of the pantry staples in your kitchen. Pay attention: The only thing I was disappointed about was the fact that there were no fresh fruits or vegetables on there; only canned and frozen. 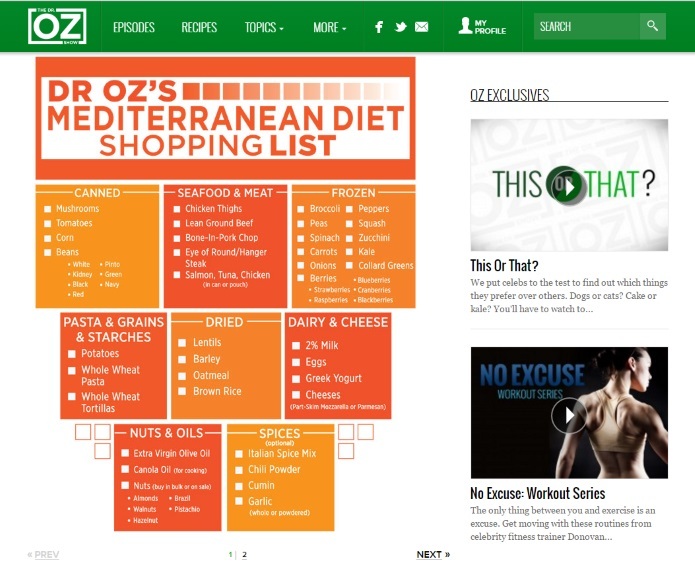 However, it is still practical, and you can find it on DoctorOz.com website. The second shopping list comes from OldWaysPT.org website. This one corresponds to their diet, and you’ll find plenty of awesome recipes on their website as well. Keep in mind: The food on this list is categorized into basic categories such as vegetables, beans, nuts and seeds, healthy oils and fat, grains, seafood, dairy/eggs, herbs and spices, and fruits. 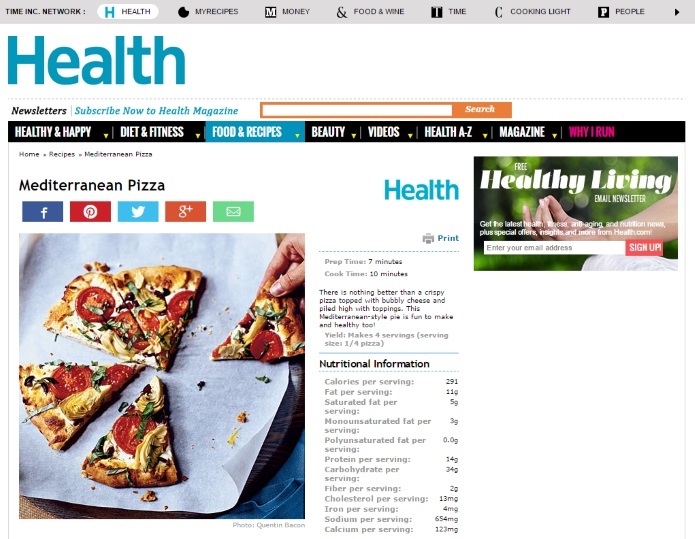 Pizza can be healthy, and this unique version published by the excellent website called Health.com is the proof. With toppings like goat cheese, crushed red pepper, tomatoes, olives, artichokes and fresh basil, this one is more flavorful than anything you’ll get from a pizza delivery chain. Sprinkle pizza crust with crushed red pepper and dried Italian seasonings. Sprinkle goat cheese evenly on the crust leaving a 1/2-inch border. Arrange tomato slices, chopped olives, and artichoke hearts. Place the pizza on a baking sheet coated with cooking spray and bake for 10-12 minutes until the crust is crisp and the cheese is bubbly. Sprinkle the chopped basil over the top and serve hot. It’s so easy to make, especially if you use a prepared crust. If you’re feeling brave, you can try your hand at making your own homemade pizza crust. It is a lot easier than you may think. 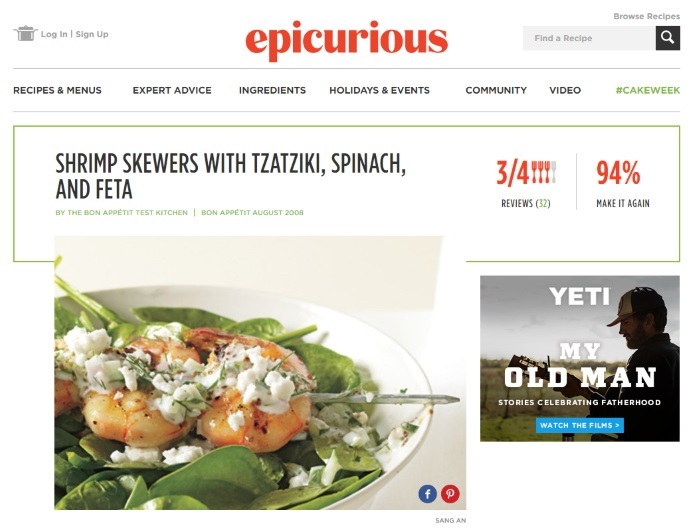 Another great online source of tasty Mediterranean diet recipes is a website called Epicurious.com, and my favorite one includes shrimp that is paired with tangy Tzatziki sauce, creamy feta, and healthy spinach. Mix yogurt with cucumber, dill, lemon juice, shallots, and 3/4 teaspoon of crushed aniseeds in a bowl. Season with salt and pepper generously and place it in the fridge to chill. Prepare your barbecue (medium-high heat) and brush grill with oil. Thread shrimps onto four metal skewers. Brush shrimp skewers all over with olive oil, sprinkle salt, pepper, and remaining crushed aniseed. Grill until shrimps are opaque in center (about 3 minutes from each side). Place spinach on your plates and drizzle lightly with lemon juice and olive oil. Place shrimp skewers on the top and spoon tzatziki over shrimp. Sprinkle with feta cheese and serve. Preparing the Tzatziki sauce is quick and simple, especially if you use Greek yogurt. This dish makes for a great, light lunch or excellent side dish. Lamb is a traditional meat in this type of region, so this recipe is fitting. When paired with mint, this dish takes on a refreshing flavor. Mix the olive oil, mint, red pepper flakes, and salt in a bowl. Rub the lamb chops all over with crushed garlic. Transfer few tablespoons of the mint oil to small bowl and brush it on chops. 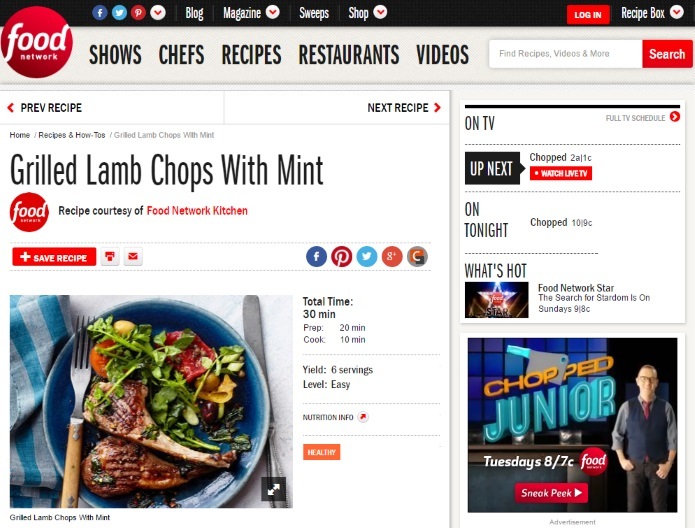 Grill the chops until charred (3 – 4 minutes for each side). Transfer to a platter and brush with the rest of your mint oil. Sprinkle with mint and serve with more mint oil. If you cannot grill your chops, you can broil them in your oven. This healthy, flavorful meal takes just 20 minutes to prepare and 10 minutes to cook. Pair with a side salad for a complete Mediterranean menu. 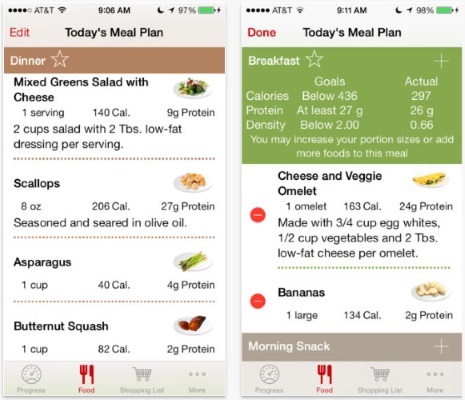 This application for iOS provides customized eating recommendations and gives you recipes to help keep your eating fun and exciting. The app uses your own personal profile to adapt the guidelines to create recommendations. Limits on how much you should be eating for meals and your snacks. 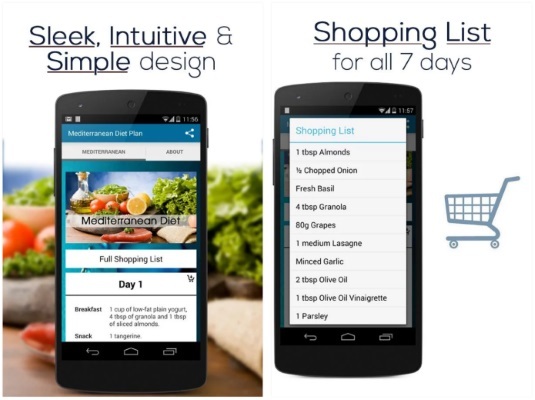 Ability to plan your menu for an entire week and even create a convenient grocery list. If you want to eat out, it can assist you to find great healthy menu choices from hundreds of chain restaurants. It includes breakfast, lunch, dinner and even snacks. Pay attention: You can get this app completely for free. Just search it on Play.Google.com and download it to your mobile or tablet device. Stacy Michaels is an expert on wellness, culinary nutrition and also works as a nutrition consultant. In this cookbook, she shares dozens of meal ideas and also explains exactly how the diet works. Pay attention: This is a great source for anyone looking for authentic menus. 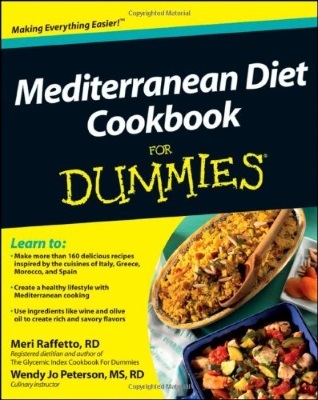 Just like all of the other books in the “Dummies” collection, this title explains exactly what the diet is all about, why it’s healthy and includes more than 150 recipes. This is really more of a guide on how to live this lifestyle than just a book with meals. 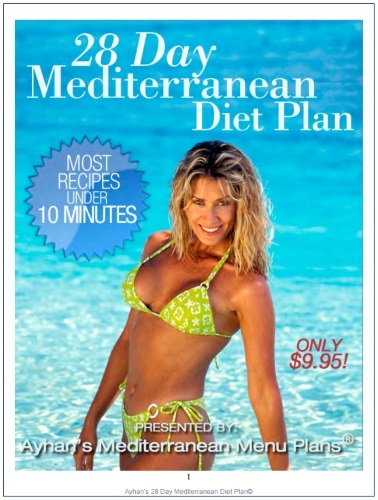 Pay attention: This is a must-have book for anyone who is just getting started with this diet.